When water freezes, it expands, and when groundwater freezes, it creates frost heave, which can crack a garage foundation. The frost line is the depth to which the soil where you live can freeze. By pouring a concrete garage footing below frost line, the builder stabilizes the garage foundation. This, in turn, reduces the risk of cracking and shifting. A backhoe is standard for digging frost footings. Call your local building authority to find out what the frost line is in your area. A frost footing, which is generally 1 foot thick and about 2 feet wide, although dimensions vary with local building codes, must be completely beneath the frost line. For example, if the frost line is 20 inches deep, the bottom of 12-inch-thick frost footing must sit at least 32 inches below ground level. Check local codes for trench width requirements. Because working in a trench is dangerous, especially if the trench is deep, local building authorities often regulate the width of the trench. In warm areas where the frost line is near the surface of the ground, you might be able to make the trench no wider than the width of the intended footing. In regions with deep frost lines, the trench should be wider. Building codes have the final say, but in general a 3-foot, or deeper, trench should be 30 inches wider on the outside and the inside of the proposed stem wall. For a standard 8-inch stem wall, the width of the trench should be around 5 feet 8 inches. Excavate the main trench to the depth of the bottom of the stem wall, and then dig the footing trench down the middle of the larger trench. Do not excavate any deeper or wider than the intended bottom of the footing. For compaction purposes, footings are poured on virgin soil, meaning soil that is not disturbed. If you dig too deeply, you’ll have to fill the bottom of the footing with sand and compact it before pouring. Determine the bottom of the footing depth using a transit. Transits are available from construction rental stores, and they come with measuring sticks and directions on how to use both the transit and the stick. 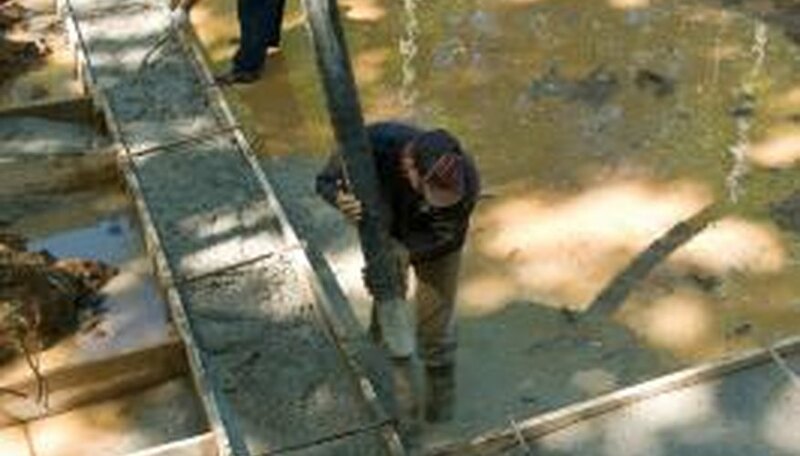 The bottom of the footing must be level. Depending on local code, you might or might not have to use lumber to form the footings. When digging the small footing trench beneath the main trench, dig only to the width required to install the forms or to pour directly into the trench. Local code will require steel reinforcement of the footing. Don’t pour the footing until the building code inspector checks the trench, the forms (if there are any) and the steel reinforcement. Frost line depends upon soil depth. After pouring the garage footing and stemwall, backfill the soil to its original depth to ensure that the ground does not freeze deeper than the footing. In colder climates with deep frost lines, local codes might require trench reinforcement before workers can form or pour the garage footing. Concrete Network: What are Concrete Footings?